It’s not that I never think of Russia, except that honestly I don’t really think about Russia. Nothing against the country, just for some reason, they never really cross my mind. 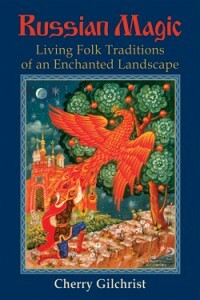 That’s why I was thrilled to be given the opportunity to review “Russian Magic: Living Folk Traditions of an Enchanted Landscape” by Cherry Gilchrist. I was hoping that I would come away with a refreshing understanding of a country that I had obviously overlooked. I was right. “Russian Magic” is everything a book of its type should be, potential authors of folkloric books take note. The book is engaging and covers a surprisingly large swath of Russian traditions, religious practices, folklore traditions, and more. It is well researched but also filled with first hand accounts from the author brushing up against these practices. There were the “standards” such as Baba Yaga and Matrioshka (those adorable nesting dolls). However I was also introduced to a colorful cast of characters like Father Frost, Mokosh (Damp Earth Mother), and Perun (Lord of Thunder). I learned about various divination practices, dates of unique celebrations, the landscapes, and even the significance of the architecture of the traditional village house! Better still, whereas most books of this type would only look at these things from the perspective of their significance in the past, the author takes all of that history and shows you its influence on modern society in Russia. I also need to tell you that I couldn’t help but be pleased when the domavoi made an appearance. Some readers may remember that WAY back in 2006 I wrote an article about these helpful and potentially harmful house guests. What I didn’t know then, but do now (thanks to “Russian Magic”) is that the domavoi’s birthday is February 10th! If you have one of these guys in your home, that’s the day to really kiss up to him! And now you know. And if you’re looking to know more, I highly suggest picking up this entertaining and enlightening book.